Now future guests at the hotel probably won't get exactly this view, but a very similar one. This was taken from the top floor of the building site two weeks ago. Once the roof is erected the view won't be as free as it is now, but looking out of one of the windows should still be fairly similar. There will be changes to the view starting next summer though: Design of new CalMac ferry drives harbour development at Kennacraig and Port Ellen terminals. With work at Port Askaig finally approaching completion Port Ellen will see the next harbour and ferry terminal redevelopment in preparation for the new Islay ferry coming into service in 2011. The ‘reclaimed land north of the current pier’ I believe will be in the gap between the silo and the row of houses (if you look closely you can just make out the bridge of a ferry behind the silo). Quite a lot of change for Port Ellen coming up there. With that thought I leave you for today, have a great weekend whereever you are and whatever your plans are! 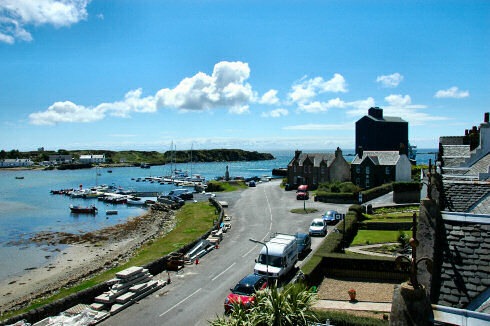 I'm planning to do some work on panoramas of several stages of the rebuilding of the former Islay Hotel. Fingers crossed it all goes to plan and I can show you something over the next few days.